Summon: Summon a 0/1 Target with Guard for your opponent in each lane. Friendly creatures have "Slay: +1/+1 and Lethal." 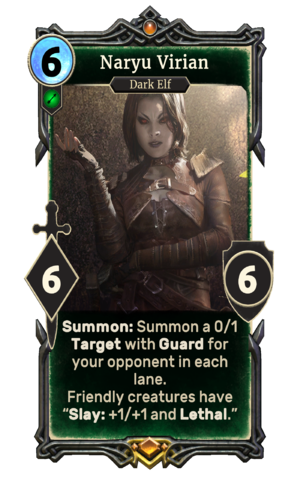 Naryu Virian is a unique legendary Agility creature card. It is part of the Houses of Morrowind expansion. "Show me what you got, hero." "I've got a job to do." The card's ability applies the Indoctrinated card effect, referring to her attempt to indoctrinate a young woman, Veya Releth, into joining the Morag Tong. A puzzle set, Naryu's Challenges, is named after Naryu Virian. Naryu Virian first appeared in ESO. This page was last modified on 2 March 2019, at 00:25.